Cabbage looper | Infonet Biovision Home. Pupa of the cabbage looper. 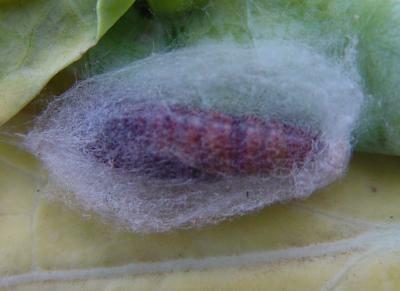 During its last larval stage the caterpillar spins a cocoon. The cabbage looper is widely distributed in the tropics and subtropics. 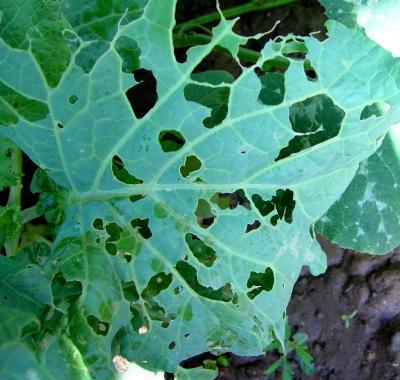 It is a serious pest of cruciferous crops, but it also attacks other important crops such as tomato, lettuce, potatoes, sweet potatoes, cotton, cucurbits, etc. The cabbage looper is somewhat erratic in occurrence, typically very abundant one year, and then scarce for two to three years. 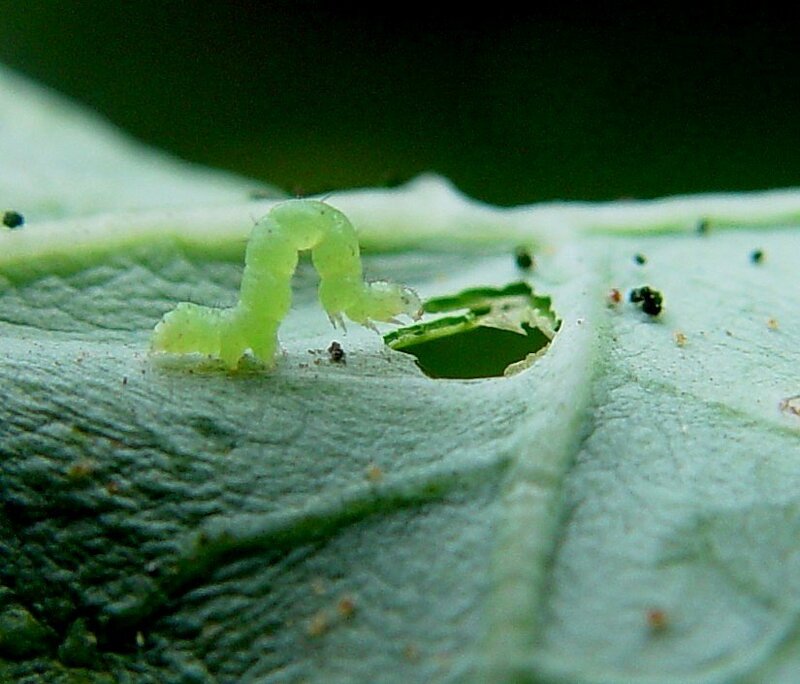 Caterpillars feed primarily on leaves and cause irregular holes. Young caterpillars eat small holes, but older caterpillars feed on the tissue between the veins skelotinising the leaves (leaving only the midribs and veins) or giving them a ragged appearance. Plants can be severely defoliated and stunted, producing no heads or becoming unfit for consumption. They may also bore into the heads of lettuce and cabbage, contaminating them with frass. The presence of caterpillars and contamination of marketable plant parts with frass reduce the market value of the produce. Thus, large amounts of dark green pellets excreted by the feeding looper may stain cauliflower heads. The presence of cabbage looper caterpillars in broccoli heads renders them unmarketable. The cabbage looper has a wide host range that includes crucifers, beans, cotton and various vegetable crops. 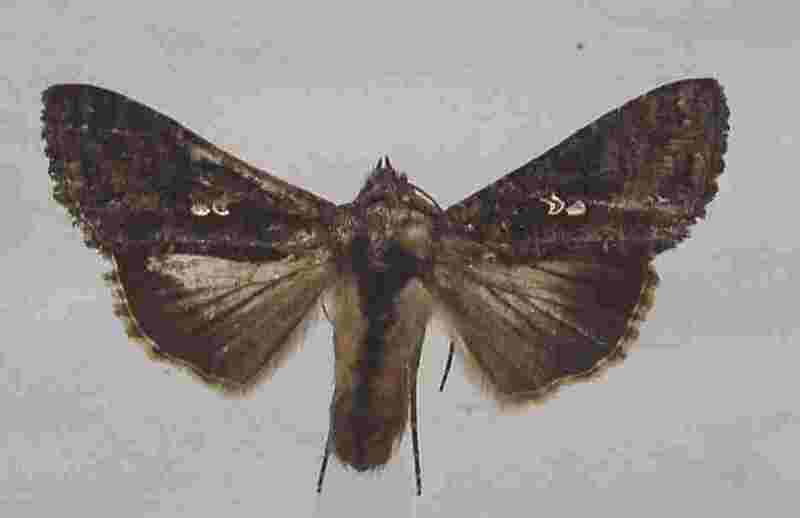 It is listed as feeding on over 160 species of plants in 36 families, but cultivated crucifers are preferred. Leaves: external feeding; internal feeding; webbing; frass visible; shredding. Whole plant: plant death; dieback; dwarfing; internal feeding; external feeding; frass visible. The eggs are round or slightly dome-shaped with ridges, and about the size of a pinhead. They are pearly or silvery white and darken when they age. Eggs are laid singly usually on the undersides of leaves. 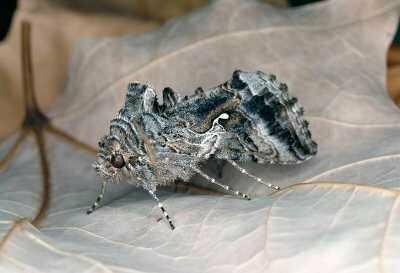 A female moth can lay from 300 to 1600 eggs. Caterpillars hatch in 2 to 6 days after the eggs were laid. Young cabbage looper feeding on a kale leaf. Mature caterpillar reaches 3 to 4 cm in length. The caterpillars go through five instars during development. Very young caterpillars are white and almost clear with a black head capsule. Older caterpillars are green with a thin white line on each side just above the spiracles and two other white lines on the dorsum. Caterpillars have three pairs of legs near the head and three sets of prolegs (false legs) near its rear. They move in a "looping" manner, arching the middle portion of the body as they move forward. Fully-grown caterpillars reach 3 to 4 cm in length. Pupa. Caterpillars pupate in white loose cocoons attached to the underside of leaves, or in a folded webbed leaf or between two webbed leaves. The pupae are light green when young and gradually turn dark brown when mature. 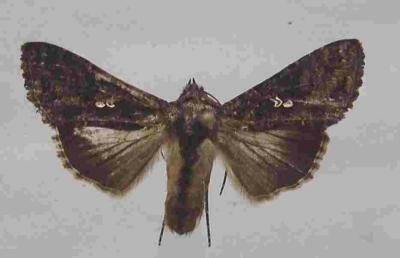 The moths are light green when young and gradually turn dark brown when mature. The moths emerge from the pupae 10 to 16 days after pupation. Further below you find concrete preventive and curative methods against Cabbage looper. Inspect plant regularly for the presence of caterpillars, leaf damage and the presence of frass. Caterpillars can be detected by scouting the crop, while adults can be monitored by using light- or pheromone-baited traps. Monitor the presence of natural enemies. They play an important role in controlling the cabbage looper. Check plants twice a week once seedling emergence begins. When populations appear to be increasing, check more often. Treatment thresholds vary depending on the crop and location. Normally, spraying should not occur when there is less than 1 caterpillar per 5 plants (CABI, 2000). A control measure is not necessary unless you find more than 9 small to medium-sized caterpillars per plant. 1. Plant resistant varieties, if available. Some resistant varieties are "Mammoth Red Rock", "Chieftan Savoy", and "Savoy Perfection Drumhead". Ask for assistance from local agriculture office to obtain cabbage looper resistant cultivars that are available in the local markets. 2. Remove and destroy all the plant debris after harvest. The pupae might still be present in the plants. Plough and harrow the field after harvest. 3. Clear the surrounding area of weeds, which may serve as alternative hosts for the pests. Natural enemies usually keep the pest populations at low levels and control measures are not often needed. Therefore, their conservation is very important. Avoid using broad-spectrum pesticides for the control of this or other pests. Cabbage looper infestations often increase after use of broad-spectrum pesticides due to elimination of natural enemies. A wide range of natural enemies attacks the cabbage looper: predators, egg and larval parasitoids (parasitic wasps) and pathogens (Bt and viruses). Egg predators and parasitoids are important since they kill eggs preventing any subsequent damage by caterpillars. The nuclear polyhedrosis virus is particularly important in controlling this pest. The virus occurs naturally in the soil or on plants in most crop areas. Virus-infected insects can be reintroduced into the field by collecting diseased insects, mixing them in a blender, filtering out large tissue masses and then spraying the virus particles back onto the field. 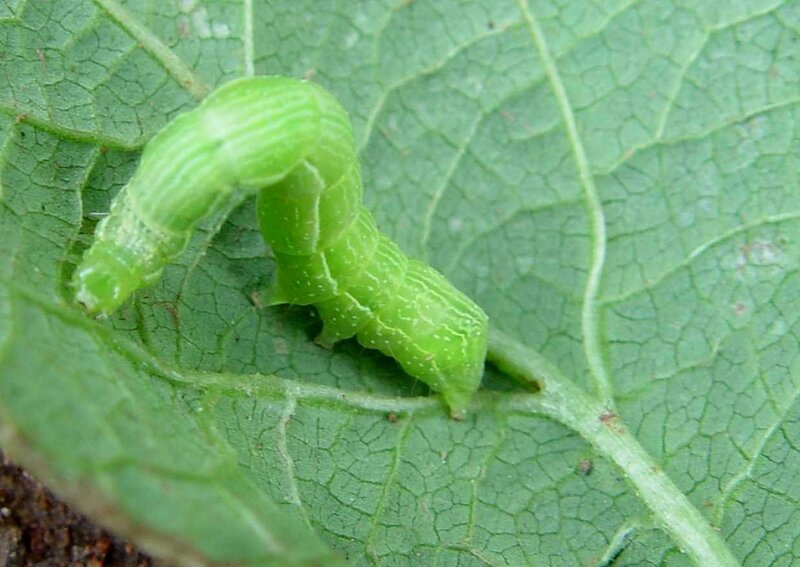 Neem-based pesticides are reported to control the cabbage looper by interfering with the growth of young caterpillars. Fairly good control of this pest has been obtained with a 2% ethanolic extract of neem seeds (Ostermann and Dreyer, 2000). For more information on neem click here. 1. Handpick the caterpillars and egg masses. 2. Use fine nylon nets as row covers to protect seedlings from egg-laying moths.